Friday: Individual qualifiers. Class 6A – Coronado runners senior Liam Walsh, junior Nick Gonzalez and senior Jennelle Jaeger-Daraksy; Franklin senior Jacobo Wedemeyer and sophomore Eva Jess. Class 5A – Hanks juniors Michael Abeyta and Rodger Rivera; Eastlake’s freshman Israel David and seniors Carlos Armendariz, Aeriel Garcia and Amaris Chavez; Chapin junior Angel Contreras; Andress senior Chauncey Wilkes and Jefferson freshman Crystal Peterson. Class 4A – Mt. View junior Nicole Estrada. Americas made history by become the first team from the school to advance to the UIL State Cross Country Championship. The Americas boys and the Eastwood girls cross country teams walked off the 3-mile course at Mae Simmons Park in Lubbock Monday fully aware of the significance of their performance at the Region 1 Cross Country Championship. For the first time in their respective school’s history – they qualified for the UIL State Cross Country Championships Nov. 3 at Old Settlers Park in Round Rock. Americas boys finished fourth with 134 points, earning themselves the final spot to the state meet. Southlake Carroll won the Region of Doom with 79 points followed by Lewisville Flower Mound (95) and Kelller (117). Lewisville Marcus was fifth, four points behind Americas. Tyler Rodriguez was the Trailblazers No. 1 finishing 14th in 15:25.10 followed by Jacob Ye (22nd, 15:33.30), Jared Laverty (27th15:42.20), Alek Duran (44th, 15:58.50) and Gage Garcia (45th, 16:00.50). Also headed to state out of Class 6A are Coronado’s Liam Walsh (5th,15:08.60) and Nick Gonzalez (8th, 15:12.10) and Franklin’s Jacobo Wedemeyer (15th, 15:26.10). Coronado’s boy finished in eighth place with 255 points and Franklin was 10th with 278 points. Jennelle Jaeger-Daraksy from Coronado finished sixth on the girl’s side in 17:44.43, two spots ahead of Franklin’s Eva Jess (17:46.05). Both qualified to the state championship. Lewisville Flower Mound won the meet with 77 points followed by Southlake Carroll (89), Keller (91) and Coppell (107), all four qualified to the state meet. Franklin was ninth with 269 points, Americas 11th with 308 and Coronado was 12th with 331. The Eastwood girls qualified for the state championship for the first time, placing third with 127 points. Freshman Lauren Walls was seventh in 18:38.80. The Eastwood girls qualified for the state championship for the first time, placing third with 127 points. Eastwood’s top five were Lauren Walls (seventh, 18:38.80), Meadow Ortiz (19th, 19:29.30), Eileen McLain (29th, 19:49.20), Lauren Villareal (44th, 20:13.70) and Destiny Martinez (45th, 20:16,50). Also qualifying for state in Class 5A are Jefferson’s Crystal Peterson (5th, 18:33.00), Eastlake’s Aeriel Garcia (8th, 18:43.70) and Amaris Chavez (11th, 18:55.90). Grapevine won the team title with 94 points followed by Amarillo (109), Eastwood (127) and Fort Worth Boswell (136). Jefferson was 5th with 143 points – 7 points shy of qualifying for state – Eastlake was 9th with 177 points, Burges 13th (387 points), Horizon 16th (473 points) and Canutillo was 19th (517). Eastlake did not qualify a team to state but for individuals will represent the Falcons – freshman Israel David, seniors Aeriel Garcia, Amaris Chavez and and seniors Carlos Armendariz. The Eastwood boys introduced themselves to Region 1-5A by easily winning the Region 1-5A meet placing it’s scoring runners in 4-6-7-8 and 15th place for 40 points to earn a trip to the state championship. Burges also advances with a 4th place finish. Grapevine was second with 119 points and Canyon Randall third with 159 points. Eastwood top five were Kayn Quinones (fourth, 15:32.30), Juan Olmos (sixth, 15:35.50), Sergio Cuartas (seventh, 15:37.30), Elias Perez (eighth, 15:39.90) and Eddie Gallegos (16th, 15:56.80). Individually, the Hanks duo of Michael Abeyta and Rodger Rivera finished 2-3 in 15:12.70 and 15:20.40 to advance. Others to advance to state are Eastlake’s Israel David finished 13th in 15:48.90 and Carlos Armendariz was 16th in 15:56.80, Chapin’s Angel Contreras (18th, 15:57.50) and Andress’ Chauncey Wilkes (19th, 16:03.30). As a team Hanks finished sixth with 188 points, Chapin ninth (260), Eastlake 10th (281) and Jefferson 12th (297). San Elizario finished third in Class 4A with 87 points. Edwin Gomez defended his individual title in 15:17.90. The four-time state champions will move on to the state meet to defend it’s title. In two surprising results, San Elizario nor Tornillo were able to defend their regional team titles. San Elizario finished third in Class 4A with 87 points. Edwin Gomez did defended his individual title in 15:17.90. Andrews won the team title with 63 points, Canyon was second with 78 points, San Elizario third and Decatur fourth (117). All four teams will race for state championship. Mt. View’s Nicole Estrada finished the girls Class 4A regional 2-mile race in 12:41.90 and qualified for the UIL State Meet. San Elizario’s girls finished in 13th place. Tornillo finished second with 91 points and will advance to the state meet seeking its third consecutive medal. Tornillo, the four-time defending Region 3A champ, just missed out on their fifth, finishing two points behind Boyd. Tornillo finished second with 91 points and will advance to the state meet. Friday: Class 4A and Class 3A. What: Region 1 Cross Country Championship. When: Monday, Oct. 22. Times (CST): 6A Girls, 9 a.m.; 6A Boys, 9:30 a.m.; 3A Boys, noon; 4A Girls, 1 p.m.; 4A Boys, 1:30 p.m.; 5A Girls, 2 p.m.; 5A Boys, 2:30 p.m.
Where: Mae Simmons Park, MLK Blvd. and 24th Street in Lubbock. At Stake: Top four teams and top 10 individuals not on a qualifying team advance to the UIL Cross Country State Championship, Nov. 3 at Old Settlers Park in Round Rock. The Americas boys have competed in the worst of conditions this season. The 2018 version is looking to become the first Americas team to advance to the state championship. Americas cross country coach Kenny Lucero is in a situation many coaches would love to be in. The Trailblzers, who will compete in the Region 1-6A Championship on Monday, do not have a number one runner. Instead, they have four runners capable of taking over a race. Americas has been steady all season, competing in Albuquerque, Lubbock and Round Rock. “As we move on to regionals and state, if they all feel good on the same day, we could be very dangerous,” Lucero said of the boy’s chances of advancing to state. Socorro junior Jazime Chacon finished fifth at the District 1-6A Championship, earning her a trip to the Regional Meet. The Americas girls, the Coronado boys and girls and the Franklin boys and girls teams will also compete for a spot to the state meet as well as Jazmin Chacon and Mario Luna from Socorro and Matthew Lindesy from Montwood. Last year, Franklin sophomore Eva Jess and Coronado seniors Liam Walsh and Jenelle Jaeger-Daraksy qualified out of Class 6A. Montwood senior Matthew Lindsey is one of two runners not on a qualifying team to advance to regionals. Socorro’s Mario Luna is the other. Jess ran a 17:17.03 regional last year, good for fifth place. At Stake: Top three teams and top 10 individuals not on a qualifying team advance to the UIL Cross Country State Championship, Nov. 3 at Old Settlers Park in Round Rock. Eastwood senior Kayn Quinones said the out-of-team meets will help the Troopers in the next two races. Eastwood looks to return to the State Cross Country Meet, this time in Class 5A. Senior Kayn Quinones and his Eastwood Troopers have experienced quite a few quality national and regional meets in the past two years. Last fall, the Eastwood boys won the Region 1-6A Championship and finished third at the UIL State Cross Country Meet. They also placed third at the Nike South qualifying meet. This year, the Troopers have competed at the Woodbridge Cross Country Classic in Irvine, Calif. and the pre-Nike Southwest Desert Twilight Classic in Casa Grande, Ariz. – an event which they won. Because of UIL realignment, the Troopers are now competing for the Class 5A state championship. Quinones led the Troopers to its eighth district championship in row, finishing third behind the Hanks junior duo of Michael Abeyta and Rodger Rivera. The Region 1-5A Championship will include six teams and 10 athletes from District 1-5A and 2-5A. Eastwood’s boys and girls qualified as well as both boys and girls from Burges, Eastlake and Jefferson, Chapin and Hanks boys and the Canutillo and Horizon girls. Burges sophomore David Gonzalez is going to need to a big Region 1-5A Championship performance if the Mustangs hope to advance to the state meet for the second row in a row. The Burges boys are also looking to qualify to state for the second straight year. Also qualifying as individuals are: Chauncey Wilkes and Lloyd Frilot, Andress; Adrian Morales, Irvin; Dylan Espinoza, Bowie; Mora Montes, Austin; Skyler Goodman, Chapin; Marisol Hernandez, El Paso; Caryn Hart, Andress; Angelina Lujan, Parkland and Jaqueline Spencer, Hanks. Eastwood freshman Lauren Walls, came away with a surprise District 2-5A championship last Friday. She is confident the Troopers will do well in Lubbock. The Jefferson girl’s have been building up for this moment all season. The Eastwood, Jefferson, Eastlake, Canutillo, Horizon and Burges girls will compete for one of the top four spots at the Region 1-5A meet in Lubbock. Andress senior Chauncey Wilkes won the individual title in District 1-5A. He finished 28th in 15:59.99 at last year’s regional. Abeyta, the three-time District 2-5A champion, was second at last year’s regional 4 seconds behind Aledo’s Graydon Morris. Rivera said he feels confident about advancing to state. Clint senior Felipe Rocha will compete for a second trip to state after his 10 place finish at the District 1-4A meet where he outlasted San Elizario senior Martin Pargas. The similarities between the San Elizario and Tornillo boys cross country teams are striking. Each team just celebrated its fifth district championship. Every year San Eli’s Cesar Morales and Tornillo’s Jesse Garcia do more with less than any other coaches in the city. On Monday morning, both will be going for their fifth regional championship in a row – San Elizario in Class 4A and Tornillo in Class 3A at Mae Simmons Park in Lubbock. At last year’s regional meet, Tornillo finished 1-2-3-15 and 25. Tornillo’s Heriberto Amaya was fifth at last week’s District 3-3A Championship. He is looking to help his team to it’s fifth regional championship in a row. Eddie Carrillo, who just won the District 3-3A championship, was third and Ofir Ortega, who was the work house No. 1 guy for Tornillo, was 15th. They will be challenged by district rival Crane which was just three points behind them at district. “When we get back, we’ll make a few adjustments again and take what we’ve been wanting for a long time which is a state title,” Garcia said. Winning a state title is old hat for San Elizario. If they qualify on Monday, which is highly likely, the Eagles will be going after their fifth straight Class 4A state championship. The return of junior Rene Arambula could not have come at a better time for San Elizario. San Elizario junior Rene Arambula eventually caught this Clint runner to take third at the District 1-4A Championship. Arambula made his return four weeks ago after breaking his right ankle. Arambula, who was second at last year’s regional, was thought to be lost for the season after he broke his right ankle in an ATV accident in the summer. Arambula was in a cast for two months. He just started walking six weeks ago and ran his first race – at the JV level – four weeks ago. His first varsity race was two weeks at the Horizon Golf Course. Morales is happy Arambula is back. Morales was impressed by how patient Arambula has been. Arambula is no longer going to take running for granted. Clint junior Brisa Aguilar out kicked Mt. View freshman Madeline Estrada at the District 1-4A meet last week. Both runners will compete in Monday’s Region 1-4A Championship in Lubbock. The San Elizario girls also qualified for regionals along with the Fabens boys, the Clint girls and Mt. View’s boys and girls team. Clint senior Felipe Rocha, finished in the top 10 at district and qualified as an individual. Mt. View sophomore Joshua Gonzalez was 14th at regionals and advanced to state, as did San Elizario junior Yajary Quiroz and sophomore America Morales. 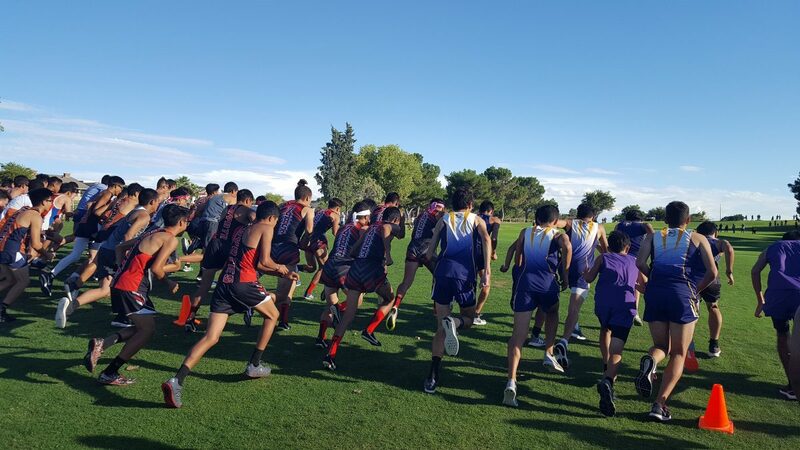 The 2018 Cross Country season began with a Race to Midnight at Socorro’s Student Activities Complex. On Monday in Lubbock, it will end for most runners. For those luckily and talented enough, the season will continue on Nov. 3 in Round Rock at the UIL State Championship. 1. Eastwood: The Troopers won its eighth straight district championship scoring 25 points and placing six runners in the top 10. Senior Kayn Quinones led the way for the Troopers finishing third in 16:14.00. followed by junior Elias Perez (fourth, 16:28,23), sophomore Nathan Hernandez (fifth, 16:28.23), junior Juan Olmos (sixth, 16:30.73), senior Eddie Gallegos (seventh, 16:30.24) and sophomore Sergio Leon Cuartes (10th, 16:46.41). Its 1-5 split was 16 seconds. The team will advance to the Region 1-5A Meet in Lubbock on Monday. 2. Americas: The Trailblazers won the District 1-6A with 38 points. It is their first district championship since 2005. Americas had four runners – senior Tyler Rodriguez (third, 16:21.83), freshman Jared Laverty (fifth, 16:35.06), junior Jacob Ye (sixth, 16:36.05) and senior Alek Duran (10th, 16:53.83) – in the top 10. The team will advance to the Region 1-6A Meet in Lubbock on Monday. 3. San Elizario: The Eagles scored a perfect score of 15 to win its fifth District 1-4A championship. Sophomore Edwin Gomez was first in 16:33.79 followed by freshman Irvin Vazquez (17:30.16), junior Rene Arambula (17:40.71) and sophomores Dilan Sanchez (17:46.68) and Jacob Ordonez (17:48.50). San Elizario seeks its fifth Region 1-4A championship Monday in Lubbock. 4. Coronado: The T-Birds jump three spots after finishing second at the District 1-6A Championship. Coronado had three runners finish in the top 10 including district champion, junior Nick Gonzalez (15:58.97) and runner up, senior Liam Walsh (15:59.51). Junior Alan Alba was seventh in 16:40.85. Coronado advances to the Region 1-6A championship in Lubbock on Monday. 5. Franklin: The Cougars advance to the Region 1-6A Championship after its third place finish at the District 1-6A Championship. Senior Jacobo Wedemeyer was fourth in 16:26.47. 6. Burges: The Mustangs narrowly defended its District 1-5A title scoring 56 points, just ahead of Chapin and Jefferson each with 63 points. Burges senior Sam Zambrano was second overall in 16:42.72. Burges will compete at the Region 1-5A championship in Lubbock on Monday. 7. Eastlake: The Falcons move up a spot after its second place finish at the District 2-5A Championship, narrowly beating Hanks by one point. Eastlake had two runners – freshman Israel David (eighth, 16:33.44) and senior Carlos Armendariz (ninth, 16:41.48) – in the top 10. The team will race at the Region 1-5A Championship in Lubbock on Monday. 8. Hanks: The Knights drop four spots after its third place finish at the District 2-5A Championship. Juniors Michael Abeyta and Rodger Rivera finished first and second in times of 15:42.74 and 16:03.89. They will compete in the Region 1-5A Championship in Lubbock on Monday. 9. Tornillo: Tornillo won its fifth District 3-3A championship in row Saturday, finishing three points better than Crane. The Coyotes placed three runners in the top 10 including district champion Eddie Carrillo (17:11) and district runner up Ofir Ortega (17:35) and Heribeto Amaya was fifth (18:21). Tornillo will be on the hunt for its fifth Region 1-3A championship in Lubbock on Monday. 10. Jefferson/Chapin: The Foxes showed some grit at the District 1-5A meet, earning a second-place tie with Chapin. Jefferson placed three runners – D’Angelo Flores (third, 17:12.23), Uciel Garcia (sixth, 17:32.56) and Jordy Cortez (seventh, 17:32.56) – in the top 10. Two Huskies – junior Angel Contreras (fourth, 17:18.78) and Joaquin Ortega (ninth, 17:34.36) – finished in the top 10. Both teams will race in the Region 1-5A Championship on Monday. It has been a long and grueling fall season that began for most teams with summer training. Championship season continues Monday in Lubbock with the Region 1 races. 8, Edwin Gomez, San Elizario, 15:14.85 (NcNeil Invitational, 9/29). 9, Nick Gonzalez, Coronado, 15:18.09 (Northeast Regional Park, 9/15). 10, Liam Walsh, Coronado, 15:19.73 (Northeast Regional Park, 9/15). 13, Victor Parra, Eastwood, 15:31.8 (Woodbridge Classic, 9/15). 14, Jacob Ye, Americas, 15:39.67 (McNeil Invitational, 9/29). 15, Tyler Rodriguez, Americas, 15:41:9 (Mae Simmons Park, 9/22). 16, Jacobo Wedemeyer, Franklin, 15:45.10 (Desert Twilight, 9/29). 17, Ofir Ortega, Tornillo, 15:47.21 (Tornillo Invitational, 9/8). 18, Brandon Seagraves, Cathedral, 15:47:50 (Desert Twilight, 9/28). 19, Alek Duran, Americas, 15:48:30 (McNeil Invitational, 9/29). 20, Alan Alba, Coronado, 15:48.83 (Northeast Regional Park, 9/15). 21, Carlos Armendariz, Eastlake, 15:51.12 (Northeast Regional Park, 9/15). 22, Jared Laverty, Americas, 15:51.29 (McNeil Invitational, 9/29). 23, Aaron Perez, Eastwood, 15:56.30 (Tornillo Invitational, 9/8). 24, D’Angelo Flores, Jefferson, 15:57.92 (Northeast Regional Park, 9/15). 25, Daniel Kennedy, Franklin, 16:03.58 (Northeast Regional Park, 9/15). Mae Simmons Park will be the site of the Region 1 Championship, one step away from the UIL State Championship. Earlier in the year, several El Paso schools competed at the Lubbock Invitational,including Tornillo. 1, Edwin Gomez, San Eli, 99 (6). 2, Michael Abeyta, Hanks, 64 (3). 3, Rodger Rivera, Hanks, 59 (1). 4, Nicholas Gonzalez, Coronado, 54 (2). 5, Liam Walsh, Coronado, 53 (1). 5, Chauncey Wilkes, Andress, 53 (2). 7, Ofir Ortega, Tornillo, 42 (1). 7, Brandon Seagraves, Cathedral, 42 (2). 9, Tyler Rodriguez, Americas, 37 (1). 10, Israel David, Eastlake, 36. Eduardo Carrillo, Tornillo, 29 (1). Rene Arambula, San Eli, 8.